As discussed in prior posts in this series, Johannes Höber made a very rapid adjustment when he reached the United States in late 1938. Within weeks of his arrival he was writing research and policy papers for the Philadelphia City Charter Committee and in less than a year he published an article on Pennsylvania politics in the National Municipal Review. Knowing English before he arrived made all the difference. Johannes’ education was a fortunate one. After completing his third university year at Heidelberg in 1926, he was selected to be an exchange student at the London School of Economics. He was 22, and he was the first German following World War I to be accepted as a university exchange student in England. While he had some knowledge of English before he went to London, the experience there cemented his fluency both orally and in writing. The year abroad also solidified Johannes’ political views. He was influenced by the Fabian Socialists and met Beatrice and Sidney Webb, the latter a cofounder of the London School of Economics. Most significantly, he had the opportunity to participate in Professor Harold J. Laski’s political science seminar. Laski was a political theorist and author and, by the accounts of his students, a brilliant teacher who challenged his students to pursue clear thinking and rigorous analysis of political questions. He was a leader in the British Labour Party and later in his life became a prominent public advocate for India’s independence. In Laski’s seminar, Johannes had to argue with his fellow students and learned to articulate positions clearly and rationally — in English. 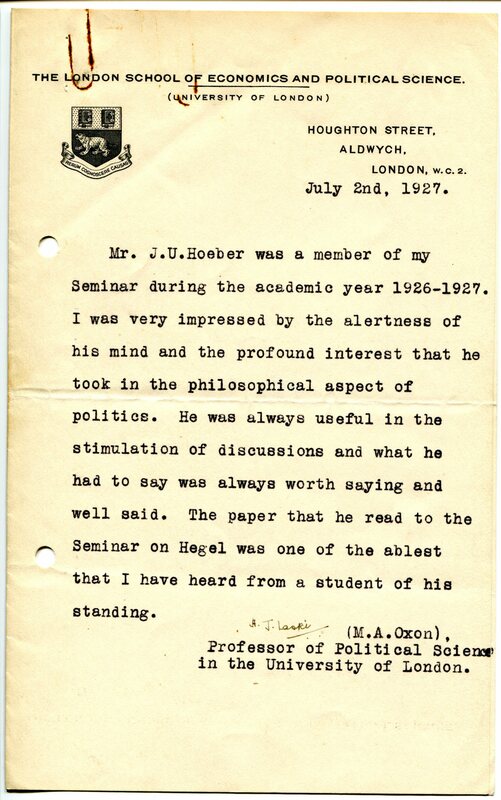 Writing about Hegel is a challenge for any university student, and it must have been an unusual paper to draw Laski’s accolade contained in the letter above. Johannes must have worked very hard to write it in clear and accurate English. After he returned to Germany from London in 1927, Johannes rarely had the opportunity to use his English over the next ten years. He retained enough of what he learned, however, to be able to summon it up when he left Nazi Germany behind in 1938 and adopted America as his new country. His ability to articulate political ideas in English led him to unusual opportunities, to be described in the next post here. Johannes had an exceptional facility for languages, but he was also totally unconcerned about appearing foolish if he didn’t know someone’s language. He was undaunted in communicating any way he could. Many years after the events described above, in the 1950s, our family traveled to Mexico and Johannes got around surprisingly well by speaking Latin to the Mexicans he encountered!